Dreaming of a lean inventory management system? 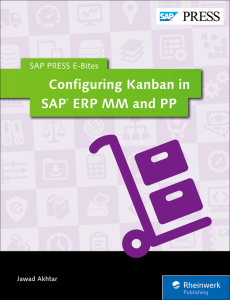 Discover how implementing Kanban in SAP ERP MM or PP can help you pull only the stock you need. From the basic concepts of Kanban through configuration, customization, and reports, this guide will ensure that you get the stock you need, when you need it. Replenishing in repetitive and discrete industries has never been more efficient! Implement Kanban in SAP ERP Materials Management or Production Planning to help you achieve lean inventory management by pulling only the stock you need. Configure storage locations, supply areas, statuses, and alerts, and then set up Kanban-specific master data. Walk through the replenishment processes and learn how to evaluate and report on Kanban to ensure the most efficient process! Akhtar is also a technical advisor to SAPexperts, an ASUG speaker, and a contributor to SearchSAP, where his “Ask the Expert” column shares real-life lessons and best practices gleaned from SAP implementations, ways to avoid common project pitfalls, and features of various SAP products that solve key business issues.